Yeongcheon Is the "Village of Confucian Scholars"
Geumseonjeong (錦仙亭), a traditional Korean-style pavilion, stands atop a solid rock by the crystal-clear stream, witnessing the dignity and nobility of the Confucian scholars of bygone Jeonseon Dynasty (1392-1910). Geumseonjeong (錦仙亭) literally means the pavilion for the Taoist mountain hermits in golden cloth. In other words this majestic pavilion is the kind of pavilion only for the god-like people. Influenced by the Chinese Taoism, the Taoist mountain hermits or Taoist wizards are called Shinseon (神仙) in ancient Korea. Shinseon is also called Doin (道人). The Korean-style Chinese expression, Shinseon (神仙), is composed of two Chinese characters: Shin (神) and Seon (仙). So, Shinseon literally means God-like mountain man, or holy man living in the mountain. They are sometimes called imaginary people with miraculous supernatural and spiritual powers in the yonder heavenly place. Doin (道人)'s literal meaning is Man of Ways. But, Geumseonjeong (錦仙亭) pavilion was built in 1781 as the resting place for the Confucian scholars called Seonbi in pure Koran language. It was built by the descendents of a local provincial governor who once ruled the area. Seonbies are normally from the noble ruling class called Yangban. They are scholars of particularly Confucian classics. 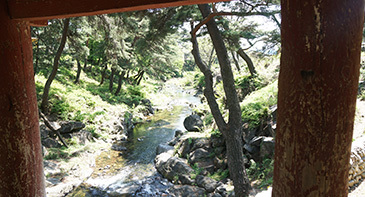 The pavilion was actually constructed for Seonbi people for resting or making poems. Situated in Punggieup, Yeongcheon City, North Gyeongsang Province, Geumseonjeong served as the pavilion for Seonbi scholars around the end of Jeonseon Dynasty Korea. It still functions as the resting place for the local people. The majestic pavilion was surrounded by a group of age-old pine trees, which symbolize the righteousness and loyalty of the Seonbi scholars. 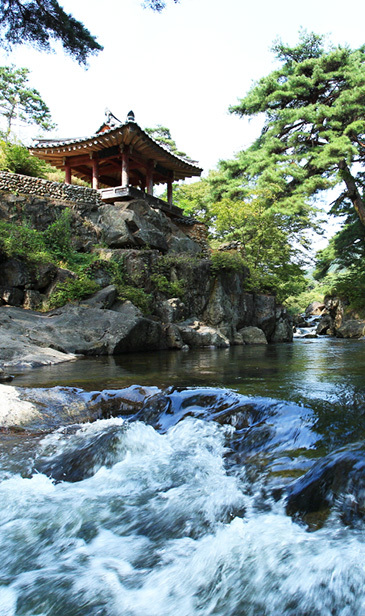 Geumseonjeong and its vicinity are long been well-known for one of the 10 most beautiful places in the nation. 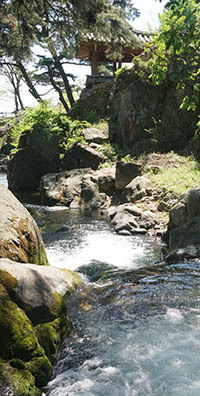 One scholar once described it as the heavenly place of god-like people enjoying silky rivulet. During Jeoseon Dynasty era hundreds of, or thousands of pavilions were built at the places of scenic beauty across the country to rest the Confucian scholars and to nurture their desire for knowledge. Dubbed as "Village of Seonbi" or "Village of Confucian Scholars, Yeongcheon is still strewn with time-honored old roof-tile houses and pavilions. Yeongcheon, northeast of Daegu, is three or four hours of car drive from Seoul. Yeongcheon with a little over 100 thousands of populations is a provincial city between Daegu and the port city of Pohang facing East Sea. Yeongcheon is the hometown of a famous local actor Shin Seong-Il, who prides himself of being a native of Yeoncheon on TVs all the while. Yeongcheon is now run by its Mayor Kim Young-Suk, a graduate of Korea Military Academy.